I was surprised at how many of you wanted a NYC red eye bus trip review, but I’m so excited to share! So here we go! First off, I traveled with Clark Family Bus Tours. Here is their Facebook page. My friend Samantha and I booked months in advance because spots fill up fast! Our bus was super nice, every seat had 2 outlets and 2 USB charging ports. The ride itself was really comfortable, but after 12 hours.. anything starts to lose its shine. We stopped 3 times on the way up and back so we could use the potty and stretch our legs, but I just stayed asleep most of the time, haha. These Bose Sleepbuds were a friggin lifesaver! Expensive, but worth all the pennies if you're a light sleeper or you have a snoring partner. SO comfortable in my ears and they blocked out all the bus noise! Make sure to bring makeup wipes, baby wipes, and wisp disposable toothbrushes. You never know when you'll get to freshen up, or how long you'll get. We were able to get a tad more sleep after we left the truck stop and then Sam and I hit the ground running at 7:30 AM! We were dropped off a block behind Times Square-perfect! 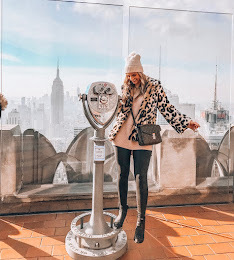 She had never been to NYC and I loved seeing her experience it for the first time!! The bus picked us up in the same location at 11:30 PM that night. Our day: Rockefeller plaza (day & night time views), St Patricks Cathedral, Saks, Macy's, Ground Zero, Statue of Liberty, Ellis Island, Flatiron Building, Union Square Holiday Market, 5th Avenue shops, Top of the Rock, Radio City, Oculus, mastered the subway, met my blogger friend Marissa (@diamondgirlsdiary) for coffee at Pret A Manger, Empire State Building, Magnolia Bakery, Bill's Bar & Burger, Bouchon Bakery, plus other mindless wandering! AKA, best day ever! I think it's safe to say everyone wanted needed a few ibuprofen and a massage when we got back home. It was a fun whirlwind weekend, but with all things considered, it will be a while before I take another red eye trip! When I got home, I propped my swollen feet/ankles up from the long trip and took a good snooze to catch back up. If you have any other questions, please let me know! Also, if you've taken a red eye bus trip before, I'd love to know your thoughts and what your essentials to bring were!